The Agilent G1312A Binary Pump provides high pressure mixing and great gradient generation in a stackable or standalone instrument. This HPLC pump is contains two integrated pumps giving you a two channel, dual piston design that should accommodate all solvent delivery essential functions. The two pump assembly for the Agilent 1100 HPLC works together, metering solvent and delivering to the high pressure side, generating up to 400 Barr in pressure. Each channel of this binary pump consists of the pump drive, a pump head, active inlet valve, with a replaceable cartridge and outlet valve, that connects to a low-volume mixing chamber. Included with this G1312A Pump is a G1379A Degasser, for a stable flow rate solution ideal for small diameter columns that need low flow rates. This HPLC component consists of a 4-channel container, 4 tube membranes and a vacuum pump that activate to generate a partial vacuum. As the solvents pass through the Agilent degasser, pressure is monitored by the pressure sensor, and controlled by turning the pump on and off to meet the need, solvents pass through the membranes, and gases are almost entirely dissolved upon leaving the outlet. 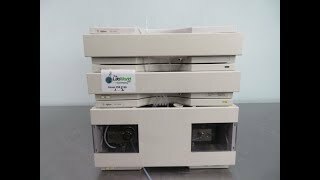 This Agilent 1100 HPLC G1312A Binary Pump G1379A Degasser has been fully inpsected, is performing without issue and comes with current validations. All of our lab equipment comes backed with our standard warranty. Should you have any questions, please don't hesitate to contact us.